Photo: Christiansen, K. et al. Complementary subicular pathways to the anterior thalamic nuclei and mammillary bodies in the rat and macaque monkey brain. The European journal of neuroscience (2016). Diamidino Yellow (DY) is a fluorescent retrograde tracer used in experimental studies of the peripheral nervous system to determine the number and origin of neurons projecting to a specific area. The retrograde tracing techniques allow for detailed assessment of neuronal connections from a single population of neurons to their various targets throughout the nervous system. These techniques allow the "mapping" of connections between neurons in a particular structure (e.g. the eye) and the target neurons in the brain. 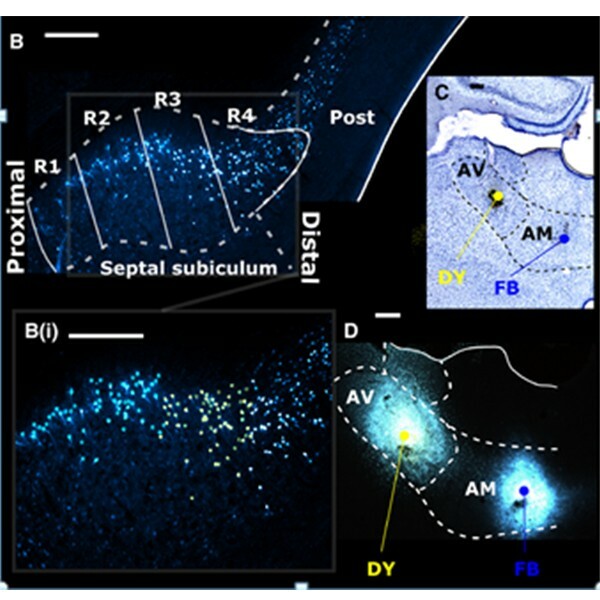 DY is transported over long distances in rats and cats, and produces a yellow fluorescence of the neuronal nucleus. When combined with True Blue (TB) or Fast Blue (FB), DY is effective in double labeling experiments aimed at demonstrating the existence of divergent axon collaterals. Kuypers, H.G.J.M., Huisman, A.M. Fluorescent neuronal tracers, Adv. Cellular. Neurobiol. 5, 307-340 (1984).